Dr Nelson, could you give some examples of how a conversation on "focusing on a solution" would go? I need specifics, because I often jump to consequences in my mind, when I don't have other tools right at the top of my mind. I'm trying, though. Thanks. life is full of positive and negative consequences. to say you have an agreement and there is not consequence to the agreement is not a model of true life situations. If a teen enters into an agreement for employment and then decides they don't want to honor that agreement they get fired. Later in life if they enter into an agreement lets say to repay a car loan. There are real consequences to not paying your loan back or writing checks. I do not feel this model reflects true life. Engaging in an argument, whining and pleading is harmful. A banker, employer or law isn;t going to whine or plead with them to do a chore beyond that this is impractical and quite possibly harmful. Anonymous…this blog post is about follow-through. It has nothing to do with whining and pleading. It is about respectfully working with teenagers to follow-through on agreements. 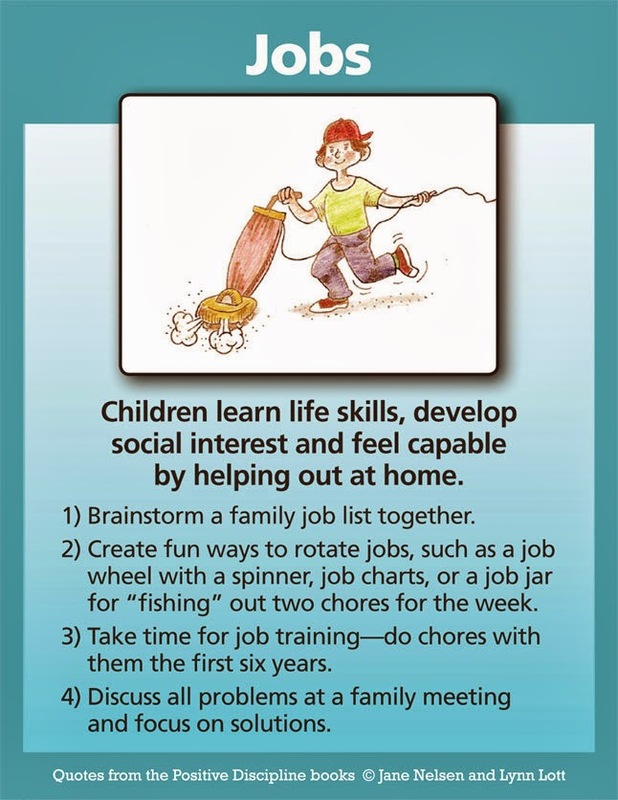 We need to remember the big picture; that we want to raise children to become warm, caring, happy adults that are independent, self confident, socially competent, responsible, and productive contributors to society. Consequences and punishments won’t get us there. I think research has proved that nagging and “telling” children, teenagers and adults what to do makes them want to do the opposite. Dr. Nelsen’s method of follow-though creates children that will honor their agreements with employers, they’ll pay their car loans and they won’t engage in arguments and whining or pleading. Children raised the Positive Discipline way are being set up for a better life. what if the child still does not complete the job, but tries to negotiate a play-date before she will do the job? Or the child just doesn't do the job, and the next day comes along when she is supposed to get together with a friend? Absolutely agree and curious about the above posting. I notice no replies, so I think it might be "too hard" for posters here? The situation I have at home is that one teen follows all the guides we set in place, and is given pocket money accordingly. The other teen fully expects pocket money without any of the chores. At the moment is doing almost nothing around the house, yet still fully in expectance of money and being driven to places etc. If we with-hold money, we're being told "you favour the other child". When we explain, she will maybe one time do a single chore, and then refer back to that chore completion for weeks as "proof" of contribution! The twist here - the "socially responsible" teen is starting to comment that she might as well not bother, because there is nothing in it for her except the thanks for completing the task! Certainly, if I went to work and got paid the same as the guy next to me, yet he was allowed to sit doing nothing....then I'd strongly consider doing nothing too! I think there must be SOME form of negative consequence when tasks are not being completed as negotiated. We need to remember that rewards are just the other side of punishment. Punishments AND REWARDS don't breed children that are motivated by good intentions. My goal is to have me children to chores because that's the RIGHT thing to do when you are sharing a household…when you're part of a family….everyone must do their part to hold the family unit together….everyone is important and needs to contribute…when paying a child or giving some other reward to get children to do chores…you're giving up a great opportunity to help your children develop "self motivation" (rather than external motivation). My children get an allowance every week….it's a given and never withdrawn…they also must do chores every week….it's a given…and when they forget….the kitchen starts to smell because someone forgot to take out the garbage….oops….I don't do it for them…but I'll walk them to the garage if it's dark and they're scared…or whatever excuse they come up with….when you start shifting the locus of control to some other external source, like allowance or play dates…you are bound to get into conflict….and about the job issue…..O'm not raising my children to eventually get a job for money….I'm raising my children to find their passion and go out and do it….the money just follows. So what do you do after trying the follow-thru and persuasion and they still refuse to do the chore?